The Lincoln Mark series was a fleet of personal luxury coupes produced from 1956 to 1998. Being offered in 7 versions, the Lincoln Mark was created as a two door personal luxury vehicle during its running era except for model years 1980 to 1983 when Lincoln Mark VI was introduced as a four door coupe. Some of the Lincoln Mark series include the Mark II through Mark VIII. The Continental Mark II was produced in 1956 and earned its reputation as a timeless beauty. Heavy both literally and visually, the Lincoln Marks III, IV and V are an acquired taste. 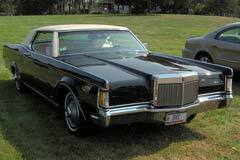 Lincoln offered a “Collector’s Series” edition for the 1979 Mark V as well as Lincoln Continental sedan. In 1984, Lincoln Mark series was downsized. While the Lincoln Mark VII did feature unusual styling, its resemblance to the Thunderbird is noticeable. 1973 Lincoln Mark Series 1973 LINCOLN MARK 85000 MILES LEATHER VERY NICE OLD CAR ALL POWER OPTIONS XINT !